lVisualV Divergence description and image. 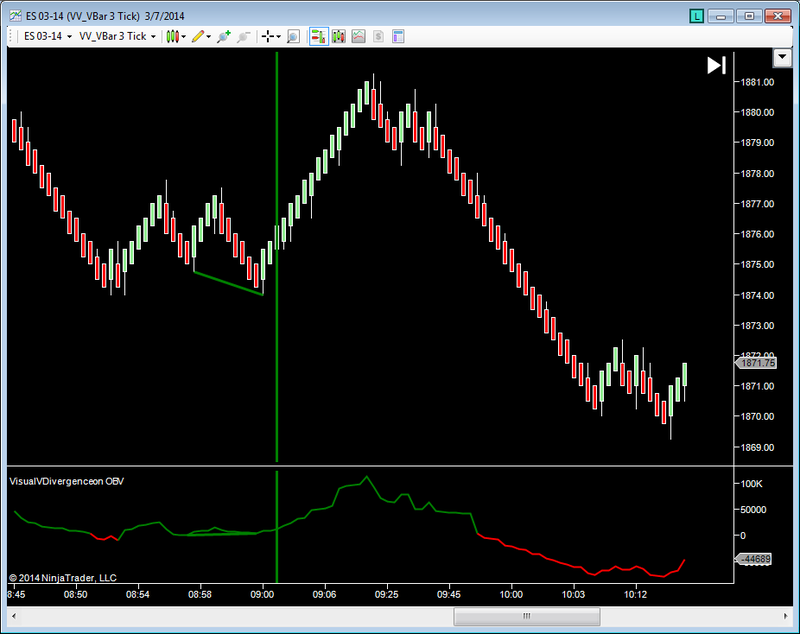 VisualVTrader's VisualVDivergence indicator locates a special type of divergence. While that method is proprietary, the user can loosen the restrictions to display a more standard definition of divergence. The user can also select the minimum swing size to display larger divergences and ignore smaller divergence within the price action. The indicator can also be modified so that divergence can be found on a MACD or OBV, etc. This particular example is using On Balance Volume as the indicator, which works nicely on the EMini market. Many of the NinjaTrader™ indicators can be chosen as the indicator on which divergence is located. Multiple instances of VisualVDivergence can also be placed on a single chart. For example, one VisualVDivergence with OBV and one VisualVDivergence with MACD could be placed on the chart and when both fire simultaneously, that might suggest a stronger divergence. The market analyzer can be set up with this indicator to obtain alerts to possible trading opportunities on multiple markets.